Good Morning! Very warm day here though not so much sunshine as yesterday when I sat making this card for the challenge at Bah Humbug! the challenge this week is to use lace. 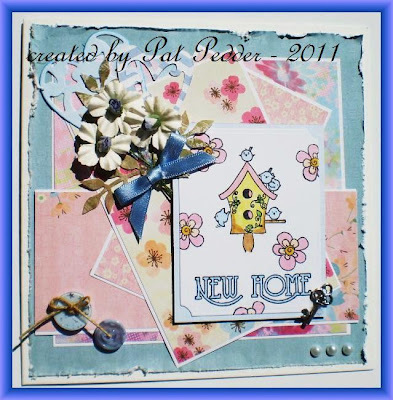 The image I used is a cute new stamp from Sugar Nellie I coloured with Copics and added some Polar White Flower Soft and Stardust Stickles. I wanted the card to be fairly clean and simple as I thought the image was quite busy, so I added my lace and threaded some ribbon through and added a bow, the paper is from my stash and I layered onto gold mirri card, which unfortunately looks black in the photo. Hope you are all enjoying your Sunday. A card today for the challenge at Bah Humbug! where the challenge is to include Beads on your project. The image I used is by Squiggle Stamps and is coloured with Copics, I added some Twinklets to the earmuffs, cuffs and boots. The papers are by Magnolia and from my stash, the ticket sentiment is by Nina of Paper Cupcakes, the beads and snowflake charm are from my daughters ebay shop The Craft Pixies and I finished with a ribbon. Well it's a beautiful Tuesday morning here, the sun is shining, the sky is blue and it's another new challenge at My Time to Craft - the theme this week is "Delightful Dogs". For my card I used a Kanban Christmas topper that I have had for a couple of years and I think they really are delightful dogs. The papers are from the Papermania Silent Night collection, the sentiment is an Anna Griffin stamp and I finished with buttons, thread and ribbon. Why not pop over to the MTTC blog and see the fabulous creations of my team mates. Good Morning, Well here we are Tuesday again and time for a new challenge at My Time to Craft, the challenge this week is to use Citrus Colours on your project. For my card I have used a new image from Sugar Nellie called "Jelly Pip" I have coloured her with Copics, the papers are by Bo Bunny. The sentiment is by Nina of Paper Cupcakes, I used as Martha Stewart edge punch and finished with ribbon and flower from my stash. Good Afternoon, though weatherwise not very good, its been pouring down for most of the day here and it doesn't look like stopping. I do have a card for today, it is for the challenge at Bah Humbug where the challenge is to make a shaped card (not square or rectangle), I thought I would make another pop up card, the image is by Lili of the Valley and I coloured with Copics and added some Stardust Stickles. The papers are by Papermania and the sentiment is from my stash. Good Afternoon, Decided this morning to get some crafting done while in the mood, so I managed to make a couple of cards, this one is for the challenge at Bah Humbug which is to include mice on your card. The image is by Penny Black and I coloured this with Promarkers for a change, I used Nesties to cut out the shape. The papers are from the Papermania "Silent Night" collection and I used a Martha Stewart punch on the border. All finished off with, gold Anna Griffin ribbon, brads, charm and a computer generated sentiment. Good Morning, the weather here in Lancashire is quite dull at the moment thought it is very warm and dry. I decided to make a card yesterday as I have two of my granddaughters staying with us from tonight until Saturday so there will be no time for me making cards until Sunday. My easel card is for the challenge at "Lovely Hanglar" which is a colour combo of Blue, Cream and Brown, I coloured my image with Copics and my papers are by V & A, Upsy Daisy and from my stash, I distressed some edges with a |Tim Holtz distressing tool. I added ribbon, buttons and computer generated sentiment. Good Morning, my card today is a DT card for the challenge at My Time to Craft, the challenge this week is "A La Carte" - Food. I used an image of summer fruit from "Making Cards Magazine" added a doily cut with a Nesties. The backing paper is from a V & A Hanoverian pad, the sentiment ticket is by Nina of Paper Cupcakes and I finished with lace, ribbon and flowers from my stash, hope you can join in our challenge this week.